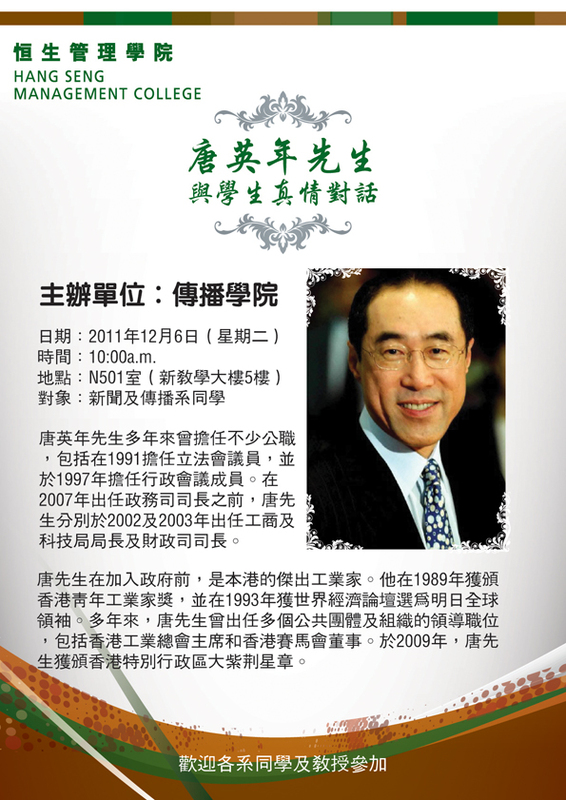 The School of Communication of HSMC has conducted a sharing session “Dialogue with Mr Henry Tang” at the lecture hall at 10am on October 30. 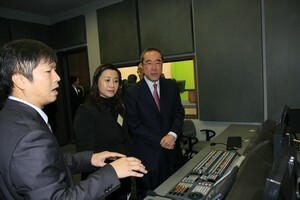 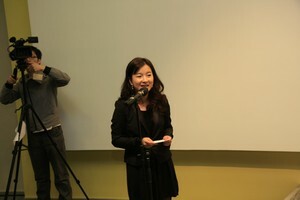 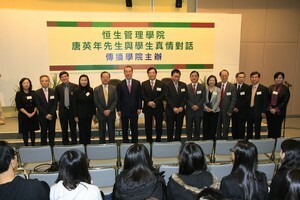 The session was hosted by Prof. Scarlet Tso, Dean of the School of Communication. 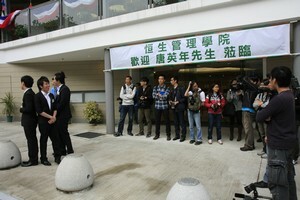 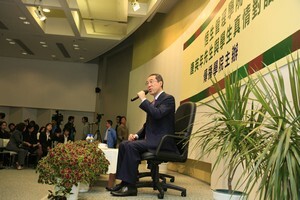 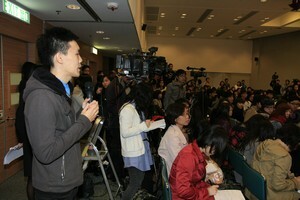 More than two hundred teaching staff and students participated in the sharing. 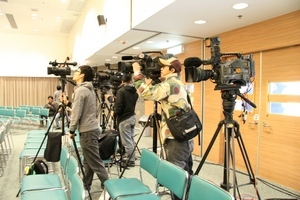 The occasion also attracted dozens of media organizations and Cable TV had live coverage of the event on their news channel. 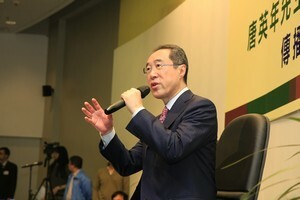 President Dr. H.S. 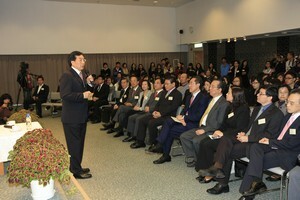 Chui and Provost Prof. Gilbert Fong delivered a welcoming speech and a thank you speech to Mr Tang respectively. 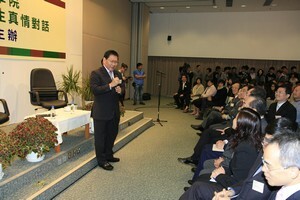 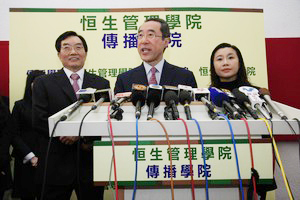 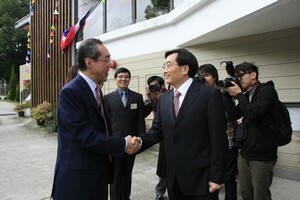 Both of them asked Mr Tang to support HSMC and private tertiary institutions’ development in Hong Kong. 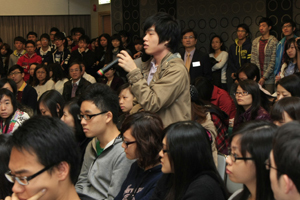 Besides the development of higher education in Hong Kong, our students inquired about Mr Tang’s points of view on various topics, including the widened wealth gap, policies and measures and his proposed future work force. 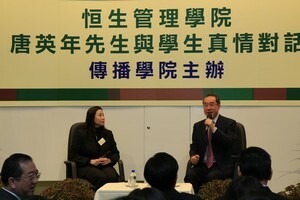 Mr Tang answered their questions one by one. 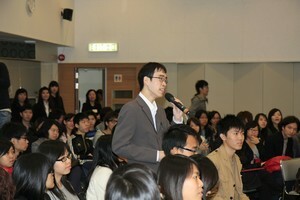 Although students from other faculties has interrupted the session with protest, Mr Tang listened to their requests and respected their freedom of speech. 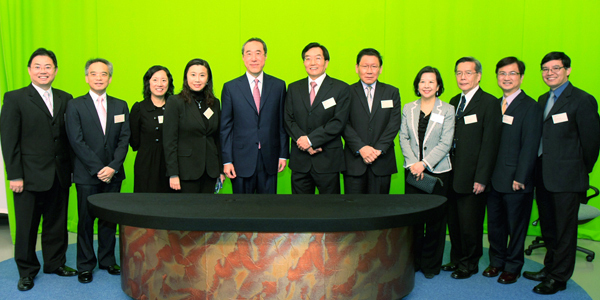 The sharing lasted for around one hour and Mr Tang, accompanied by Dr. Chui, our school directors and teachers, paid a visit to our faculty’s advanced TV studio. 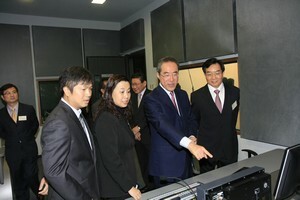 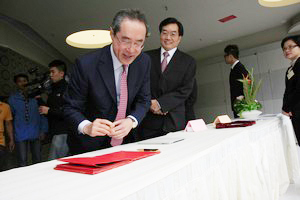 Mr Tang showed his interest in the equipments and production routine. 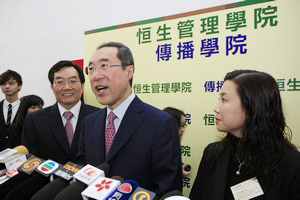 Before his departure, he promised that he would listen to the requests of the student protestors on the day and visit HSMC again if he is successfully elected to be the next Chief Executive.